Description - The colouring of a lynx is buff or tawny with mixed blackish hairs and the underparts are cinnamon-brownish. The tail is short and tipped with black; ears have long black tufts and cheeks have long pale ruffs which form a pointed beard at the throat. The feet are very large and well furred. Average weight is from 10 to 40 pounds. Distribution - The lynx prefers the deep forest. In B.C. they occupy most habitats but are generally absent from the coastal region. Biology - Female lynx bear usually 2 kittens in May-July who remain with her throughout their first winter. They make their dens in hollow trees, tangled thickets and under logs, stumps and fallen timber. Their large, thickly furred feet allow them to stalk their prey silently and give them better speed through soft snow where other animals may flounder, though not the Snowshoe Hare which is the lynx's chief prey. A chief characteristic is their 9-10 year cycle of peaking which parallels that of the snowshoe hare. The lynx lives as long as 12-13 years; the chief factor of death is lack of nutrition. Man, who values its long, silky fur, the wolf and Mountain Lion are its main predators. 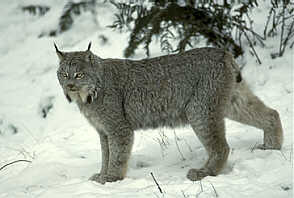 Tracks - The lynx resides mainly in snowy country and has therefore adapted to this climate. The feet are heavily furred making the tracks appear rounded and obscuring the toe prints. The tracks are larger than that of a bobcat and similar to a mountain lions although the lynx doesn't sink as deeply into the snow.